Hunting elk is hard work. It means trudging through miles of possibly unexpected terrain. When you’re putting yourself into those conditions you don’t want to be stuck out there with a bad pair of boots. 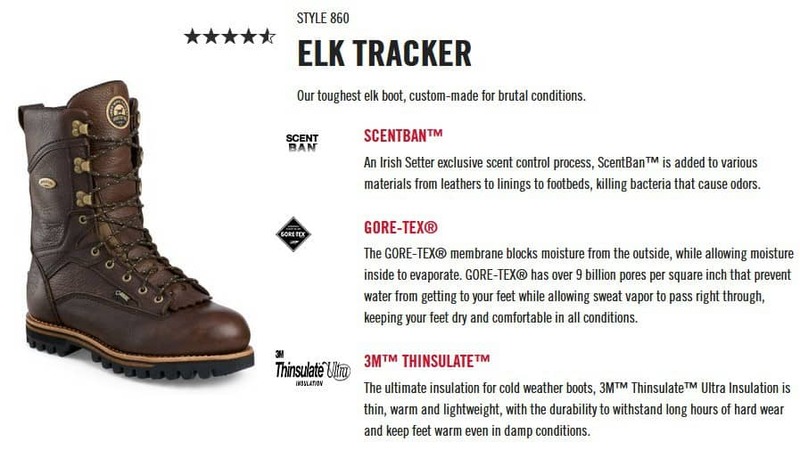 So in this article, we’ll be talking about the best boots for hunting elk. While your needs will likely be similar to other hunts, there’s still some things which you’ll want to be on the look out for that can help your cause. Many of these features have to do with the terrain where elk like to call home. Let’s go over some things that we’re looking for in an elk hunting boot. Depending on what kind of elk you’re after they can live in a surprisingly wide array of habitats. However, there’s a couple of things which you’re bound to want to choose gear for. Here’s some things to consider. In many cases, in order to find elk you’re going to need to head to a higher elevation. Not only for spotting, but sometimes that’s just where they’re hanging out. This means navigating some potentially dangerous uphill territory, and boots with good traction and grip are a must here. Elk hunting happens in the back country, and you might need to hike for several miles before you get into a good position for hunting. The boots that you pick should be easy to break in and offer excellent protection from blisters and foot injury. While insulated sounds great, it’s not the best choice if you plan to be hunting in warm climates. 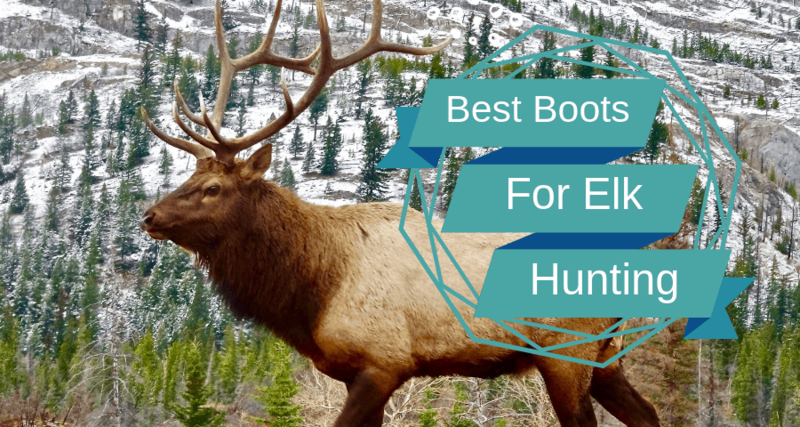 If you’re looking for the best boots for hunting elk in Arizona for example, then you should opt for an uninsulated boot. If you plan to be hunting in colder climates, then insulated is the way to go. Alright, now that we know what we’re looking for it’s time to get to our recommendations. We’ve chosen the highest quality boots possible for this article. All of our picks are reliable footwear that will last you a lifetime, and you’ll be glad to have them in your gear when your deep in elk country. Our first boot is a beauty that actually could be great for any environment. They actually have an insulated and uninsulated boot available. If you plan to be hunting elk in a warm enviornment like Arizona, then you’ll want to go for the uninsulated version. Otherwise you’ll just be hot and uncomfortable for the entire trip. If you plan to hunt in both warm and cold climates then you could opt for the uninsulated boot, and then pair it with some warm socks and boot warmers for slightly colder climates. This of course depends on your cold tolerance though. However, the Kenetrek boot has a lot more to love than just this. They also provide excellent foot protection for those looking to traverse harsh and mountainous terrain. Kenetrek makes blisters a thing of the past, and they provide great traction to boot (no pun intended). They also offer a superior waterproof membrane which keeps your feet dry whether you’re moving through creeks or snow to get to your next vantage point. Both the insulated and non-insulated version also comes in narrow and wide sizes so you can get the perfect fit. There’s only one negative about this boot really and that’s that you’ll need to allow for a little extra break in time. They come out of the box a bit stiff, but once you’ve got them broke in they’ll be your favorite boots for life. Check ’em out here. If you’re looking for a cold weather boot, then this one will definitely fit the bill. However, it’s also a great all around waterproof boot thanks to their unique waterproofing technology. While other waterproof boots trap moisture inside and soon you’re slipping around in your own sweat, these allow it to evaporate. They do a great job of keeping your feet protected from the elements without build up of sweat or odors. In fact, they even have a scent control process in the lining that keeps bacteria and smells from building up in your boots. They also feature lightweight and warm insulated liner for keeping your feet nice and warm in cold weather climates. However, these are probably a poor choice if you’re hunting in warmer climates. The insulation will likely be a little much, and you’ll be better off going for an uninsulated boot for these hunts. They fit and feel great right out of the box, and Irish Setter (Redwing) makes fantastic products. Plus, since these are welt boots, they’re eligible for repair and possibly resole by Redwing, so you can fix them rather than buy a new pair. You can check out these boots here, but you may want to order a half size up. Some hunters report these boots run a little tight. Danner has a reputation for making stellar boots, and the pronghorn is no exception. 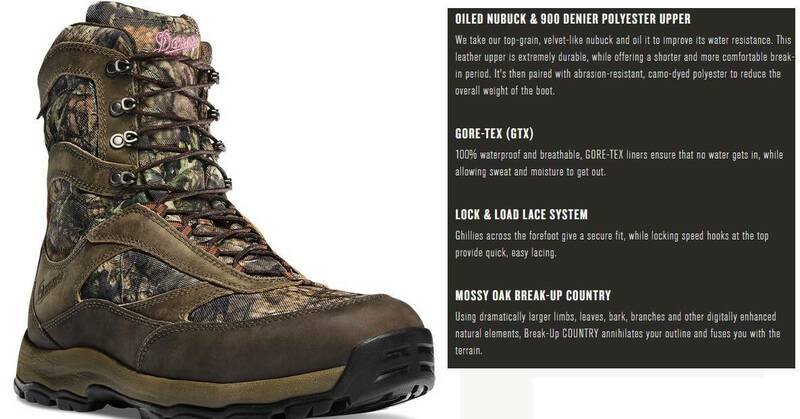 If you’re looking for great elk hunting boots but you have wide feet, then this could be a good option. The Proghorn is available in wide sizes, and they are roomier than other options on our list like the Irish Setter boots. However, if you do find you need to make them a little more snug, then some thicker socks will likely do the trick. These boots are both durable and flexible. That’s a great combination to have when you’re out in the back country and you need boots that allow you great mobility that won’t quit. While it might take you a bit to break in these boots, once you do they fit perfectly. They’re waterproof but uninsulated, making them a good choice for warm weather hunts where you may be traversing water and mud but need to keep cool. However, some hunters have expressed disappointment with the level of waterproofing that the boots have. So, while they will be great for arid climates, don’t expect to stay 100% dry with these if you traipse through streams and creeks. The boots are extremely lightweight as well, making them perform like a boot but wear like a sneaker for maximum comfort. However, they can’t be resoled like some other boots can, so once they’re worn out they’re gone. As a bonus, they’re so lightweight they make a great work boot too if you need something dual purpose. If you’re interested in seeing all the features of these great boots, you can do so here. When hunting in certain climates there’s a danger lurking that can be a serious threat for hunters. If you encounter any venomous snakes on your trip, one mistake could be a matter of life and death. Especially if you’re miles out with no way to get help. If you’d prefer to have a little protection in this department, then the Thorogood snake boot might be for you. These boots feature a snake guard material to save you from bites that will ruin your hunting trip for sure. They have great waterproofing, but also a breathable membrane to keep your feet comfortable. You can also hunt all day without fatigue thanks to their comfort foot-bed and cushioned insoles. The boots have great traction, making them great for traversing through mud, streams and over wet areas. However, they don’t have the best ankle support, and this might make them a poor choice for going over rocky terrain. The best feature of these boots is likely the price. They’re quite affordable, and they’ll serve you well in many different hunting styles. Check these out here. If you’re looking for a more affordable boot that’s a legitimate hunting boot, then the Rocky Retraction is a good choice. This is an insulated boot that’s great for cold weather hunts where you need to keep your feet warm. Hunters who choose these boots rave about them having superior waterproofing and a right out of the box fit that feels great. However, there are some mixed opinions about these boots. While many people say that the waterproofing is excellent and that the quality is also great, some don’t have the same opinion. It’s possible that there is a quality control issue, but it’s hard to be certain. 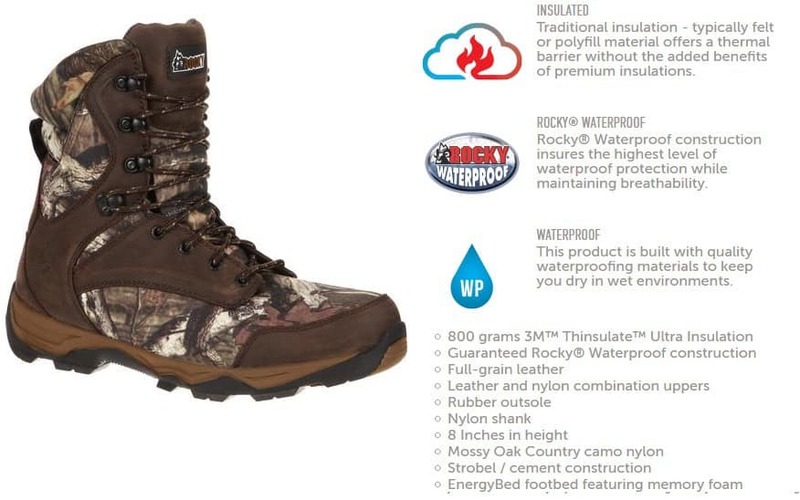 Rocky does however offer an amazing deal on great quality boots, and the response to their products is mostly positive. You’ll also be missing out on some of the fancier features of the more expensive boots. These are not 100% leather, which is less durable and prone to wearing out faster. They also don’t feature the same breathablity that some others might have. Sizing is also more limited, and you may have trouble here if you have wide feet. Check ’em out here! What about elk hunting boots for women? While it might be a little tougher to find a good hunting boot for women that’s functional instead of fashionable, there are some options out there. 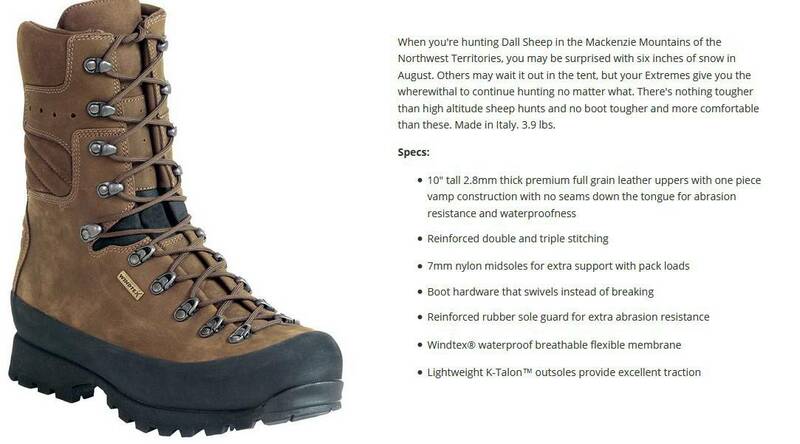 We recommend the Danner High Ground. These boots offer a light and comfortable fit that allows you to traverse all sorts of terrain without being impeded by heavy shoes. They’re waterproof, and they come in different levels of insulation. You can get them uninsulated for warm climates or up to 1000G for cold weather hunting to keep your toes toasty warm. They’re serious boots for serious hunters. Not something that will fall apart on you or leave your feet full of blisters when you’re miles out on the trail of big game. Check out the reviews here.